Whether you’re just starting out in the terrain park, or you’re seasoned at hitting jumps and sliding rails– our terrain parks have something for everyone. Start out in the Magic Park in our beginner terrain area near the Base Lodge and work your way up to the Central Ave. Park on Chair 3. The Chair 3 area is basecamp for park riding– you can lap the chair all day, hitting different features in three parks. Care to race your buddies through a snowboard cross / skiercross course? Head to Chair 7’s Goat Haunt Course. Terrain Park opening dates are weather dependent and vary from year to year. Please keep an eye on Whitefish Mountain Resort’s Facebook page for regular park updates. Located near the top of Chair 3, Minnow Park is where our littlest jibbers (or any novice) can start. A few “mini rails” allow anyone a chance to see what it takes to ride a rail without fear of falling off. These are designed to be smaller than Depot Park and will be a natural fit for first timers. The Depot Park offers smaller jumps and jibs and excellent learning terrain. The park features a series of jumps, rails and boxes that focus on getting you ready for our larger Central Avenue Park. 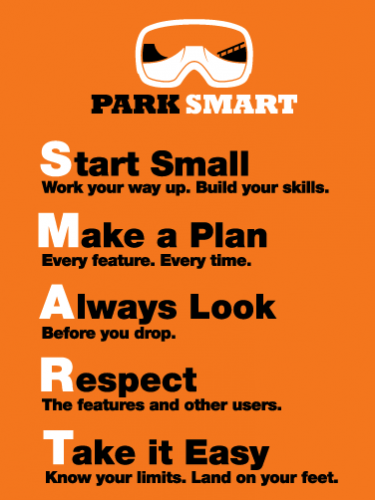 This park is all about working your way up from smaller jumps in the Depot Park to the larger jumps in Central Avenue. Expect 2-4 jumps geared towards intermediate park riders. This is our bread and butter park. Expect 3-5 jumps and a rail line focusing on medium-sized park features, multiple take-offs and a packed rail garden full of creative features will keep you shredding through the day. Our skier/boardercross course features banked turns, small jumps, rollers and other terrain features. We start construction here in December, and the course continues to grow until mid-March, when The Nate Chute takes place. Always remember to obey the skier code and inspect the course before giving her a go.